A New Word presents viewers with a seemingly simple question: “What do you believe?” Participants must respond through one of several computer interfaces, one word at a time. As each individual responds, their word populates across all other users’ screens. This democratic process results in an amalgam of phrases and sentences which reflects the beliefs of all those who participated. Typed words are converted to speech in real time, and music is generated according to the responses of visitors. Superior Pattern Processing is an audiovisual space where visitors attempt to solve patterns. Based on their responses, the room changes to different videos and sounds. When enough patterns have been solved correctly or incorrectly, the room transforms to one of two states: "Wakefulness" or "The Delta Wave." The work questions the "superior pattern processing" ability of humans by providing a kind of intelligence test that leaves participants questioning the impact of their choices. Visitors to this space ponder their actions while immersed in multiple projections, a computer network, and a clinical, cerebral soundscape emitting from a sound system placed around the perimeter of the room. The Voice Confined is a series of interactive sculptures which speak to confinement and suppression of voice. Crushed and Burned is a castaway box, housing a destroyed object that still speaks from within. All sounds were collected from the internal object's destruction. Bind reflects the ephemeral nature of those who occupy its space. In the video, someone enters the room and finds a large, cumbersome book. This person sits across from you and begins to glance through its contents. As the reader moves through the book, he encounters something strange, something that looks familiar. A portrait of Art Bell based on a spectrogram analysis of the late broadcaster's voice. 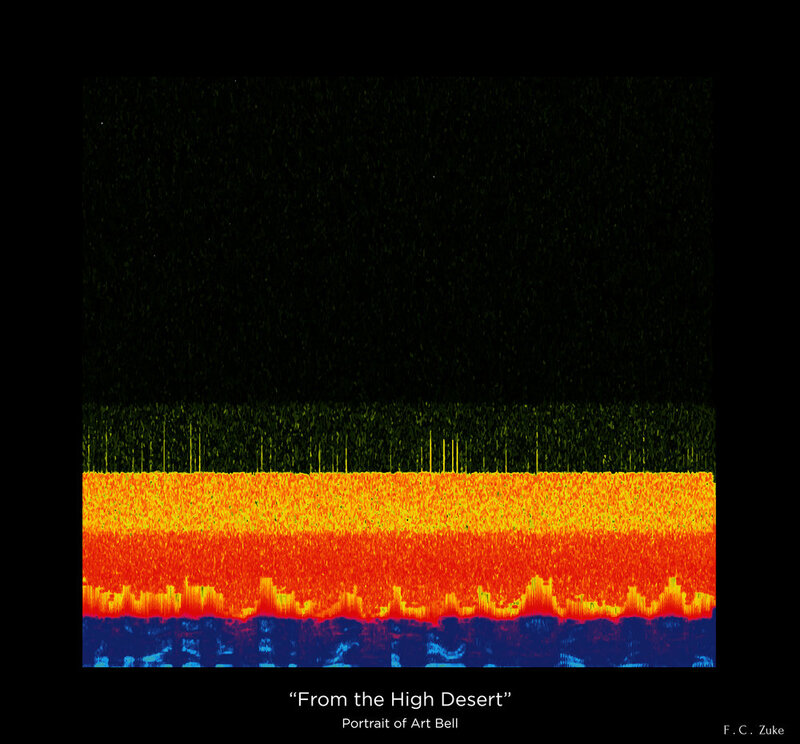 This image was captured during his signature welcome, "From the high desert..."
Someone Must Look is an audiovisual work that requires the presence of a viewer. A single participant enters the room and is seated in a chair. This simple act causes the work to respond to the viewer. The work touches on how authority figures amass power by exclaiming others to be defected in some way. Ladder is a memory space. Several strips of video play back recordings of those who were in the space previously. The work interrupts the complacency of passersby and draws their attention to others who share the space. The Drink You Drink is an experimental, sound-driven, symbolic film. It is inspired by the idea that two seemingly different things may in fact be the same, and that they may each lead to the same dark end. Each section of the film may be thought of as an intensification of this idea. Graveyard Shift is a piece inspired by the events that I experienced while working overnight at a retail store. I filmed the videos over the course of two days and then spent one week editing the video and one week writing the music. All videos were shot with a GoPro camera in Lincoln, Nebraska and in an abandoned pioneer's cemetery in western Iowa called Slates Cemetery (est. 1878).